Hey everyone! It's that time of year where all the brands are putting out fabulous gift sets. 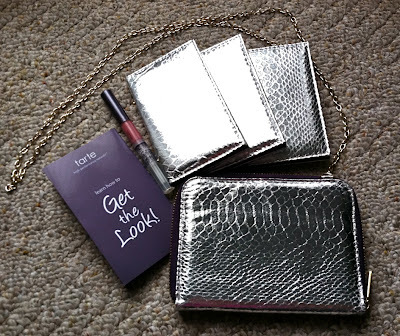 The folks at Tarte gave me the opportunity to try and review their limited edition Puttin' on the Glitz collection. Just click that link if you want to check it out on the Tarte website- it's $48.00. The idea here is that you get a small, clutch-like purse with a golden chain that makes it long enough to be worn in a cross-body style. You also get three separate color palettes- each with six eyeshadows and a cheek color. Also included- a PureOptic lip gloss and a little pamphlet to give you some ideas for how to use everything. In this post I'll share lots of pics and descriptions, and also my overall review! Both the palettes and the purse have a metallic silver reptile print, and everything is lined with plum. There are snaps on the side of each palette, so when you're on the go- you can choose whichever palette you want to use and it'll just snap into the purse. There's also a little elastic band to hold the lip gloss, a small mirror, a space for credit cards/cash, and a little slot where the instruction booklet was hiding when I got it. Below you can see the three separate color palettes (these do not include mirrors). They all have a magnetic closure, but it seems to be rather weak... so don't be careless if you're just tossing these into a purse on their own. Walk in the Park has 3 matte shades- a dark brown, light brown, and cream. The shimmery shades are a forest green, bronze, and champagne. The bronzer is also shimmery, and not super deep in color. It's the Park Avenue Princess shade of Amazonian Clay bronzer. Could be worn lightly to add a little glow to most skin tones. With the exception of the green shade, the eyeshadows remind me a lot of the Wet n Wild 6-color Vanity palette. I don't consider there to be any "duds" in this set. The matte shades are rich and pigmented, and the shimmers are pigmented without being gritty or flakey. The dark brown and green make nice liner shades and I really love the bronzy/brown in this kit as well. There's one matte shadow in this set- it's the light taupe in the lower left corner. The remaining shimmery shades include a bronze, plum, light peach, light pink, and cream. The blush is a soft, shimmery pink- it's the Amazonian Clay blush in Darling. I LOVE the top 2 shades. Big fan of bronze & plum, especially worn together and these are gorgeous. They also make nice smudgy liners- but aren't dark enough to provide lots of definition in that way. I'm not head over heels for the rest of these colors. I can't really come up with a good use for the matte, light taupe. The light peach and cream shades are nice, but nothing really different. The one "dud" shade in this palette is the light pink in the center on the right. This shade was pretty flakey and didn't apply in a very pigmented way. This is the dramatic kit of the bunch. You get 2 deep matte shades- a black and a plum. There are 2 super shimmery shades in the center- a silvery lilac and charcoal. The two lightest shades are a bit more pearly- a lilac and a light pink. You also get a pretty highlight- and Amazonian Clay shimmering powder with a hint of a golden tone- reminds me of candlelight, and could easily be a shadow as well. 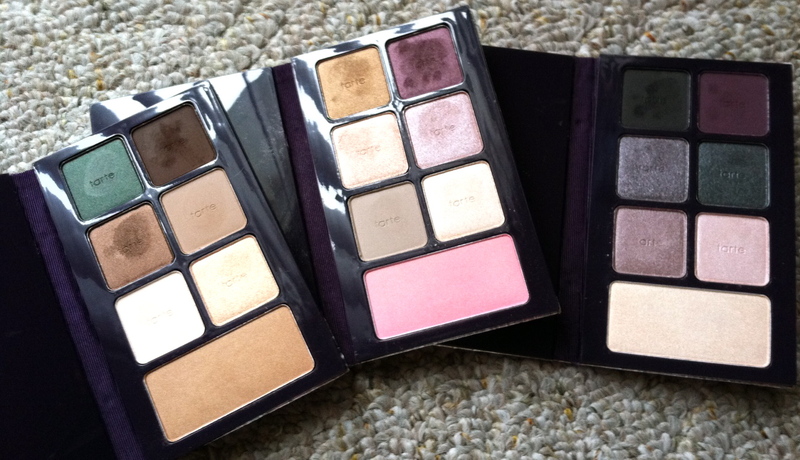 I love the overall look that a palette like this creates- I love smokey plum. 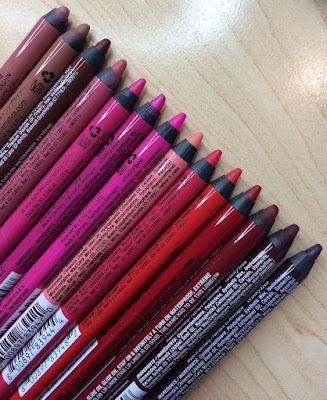 The matte colors are everything you'd want from a matte eyeshadow and also make great liners. I also really enjoy the charcoal, as well as the two lighter colors. I won't really call it a "dud", but for me, the most eye-catching color in this palette- the silvery lilac (center, left) is also the most flakey and generates the most fall-out when you tap into it with a brush. Pack in on your eye with a nice primer or base, and it looks pretty- it's just not the easiest to work with. You also get a PureOptic lip gloss with this kit- the creamy, medium-pink shade is infused with Maracuja Oil (another signature Tarte ingredient). This has a smooth, non-sticky texture and a minty scent. Unlike the Tarte Starlet collection (click here to watch my video review), this set is all about portability. However, I don't know if it's just me, but when I go out, I usually just take a lip gloss and a compact mirror. (add lash glue if I'm wearing falsies.) Besides moments when I touch-up before the newscast, I never touch up my eyeshadow or blush when I'm having a night out with friends, or running errands. So the ability to snap an eyeshadow palette into a little purse isn't that much of a draw for me. It's a cute little purse, but you really can't fit much else into it. And call me paranoid... but if I'm going to the club- I don't want my dear sweet eyeshadow palette getting smushed in a crowd or spilled on. The little purse doesn't offer that much protection. Not to mention the fact that if I'm going to take an eyeshadow palette on-the-go, I'm going to also need brushes. Can't really fit those in the purse. Fortunately, these aren't GLUED into the purse, so you can just use these on their own... throw them into your travel bag for a weekend trip or holiday travels. If you're like me and you take a makeup bag to work, you can just put the little wallet-sized palette in there and you're all good! 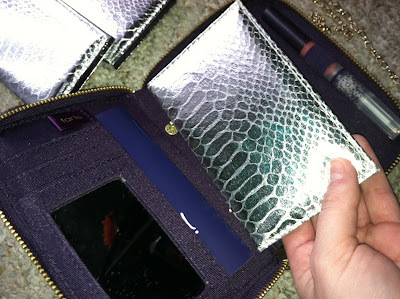 So where packaging is concerned- I'm not nuts about the little purse, but the brand redeemed itself with the ability to just tote the palettes around on their own- something many of the gigantic holiday collections don't allow you to do easily. It seems that the magnets that hold the little palettes closed aren't super strong, but not to the extent that I feel scared to put these in my makeup bag and take them somewhere. Just be a little cautious. If you're a fan of Tarte eyeshadows and Amazonian clay blushes/bronzers- you're going to enjoy these palettes. The shadows have the classic Tarte appearance and quality. As I noted above, a couple of shadows here and there are a bit flakey, but as a whole, they're very nice quality- with good pigmentation and great staying power when used with a primer. Don't feel like you can't mix and match colors among the three kits. Each one contains at least one matte color, and I find them to be very user-friendly and wearable across the board. If you're looking for Urban Decay style bright colors- this may not be what you're looking for. But if you want to add some neutrals & smokey plums to your collection- this is right up your alley. It's also a pretty safe gift item for someone else. The little pamphlet numbers every eyeshadow and then gives you some ideas of how to wear them if you (or the gift recipient) feel lost. The Girls Night Out palette is my favorite part of the kit, because it's the one you can get the most extreme with. You can definitely get a great smokey eye with that one, or you can use that black to amp up any of the other palettes. Just got an idea for my next look- bronze from Nine to Five paired with the matte black from Girls Night Out! Woop woop! I also can't complain about any of the face products, or the lip gloss. Do I like this better than the Starlet? Portability wise, I definitely do. These are so easy to travel with. I think you get a bit more color variety in the Starlet... I mean, there are 24 eyeshadows in that one and 18 in Puttin' on the Glitz. In the Starlet you also get a fantastic, classy looking jewelry box AND 2 lash products, AND 4 face products instead of 3. But if you're a plum girl, Puttin' on the Glitz has better selection and quality of purples. So I guess they both have their place. Each set has a couple shades here & there that aren't totally phenomenal. Overall, the Starlet is that special, deluxe gift that'll keep having a purpose even when the makeup is gone. Puttin' on the Glitz is also super special in that you're getting 3 separate palettes... and the portability is something some people might value more. Hopefully my extensive analysis on all this stuff hasn't just confused you more- but since I recently reviewed the Starlet, I felt the need to give a bit of a comparison :) Before the holidays I'll definitely make a "gift ideas" video with more ideas. I LOVE when it's time to fall back for Daylight Savings time! Gotta love the extra hour. Tyler & I are watching the Rams/Cardinals football game. Larry Fitzgerald has a teensy waist. Also, Steven Jackson is a beast! Speaking of beast, my stomach is growling like there's a beast in there. I love when people who speak other languages tell me their English gets better when they watch my videos. That is seriously so amazing to me! I just wanted to say that you are by far my favorite guru! You focus on a wide range of products and you don't only talk about high end stuff. I'm 14 and can't afford high end stuff, so I rely on drugstore. I feel like your reviews are really honest and your videos make me want to try new stuff all the time! Because of your videos I got the Revlon lip butters, and I love them!! I'm loving your Non-Stop November blogs! I would like to see a video for the holiday season. Could you do a gift idea video for me to give to my friends? I have two best friends and I want to give them something with a few different makeup products in it. That would be a really helpful video! I am such a sucker for cute packaging, but $48 is a bit out of my price range! Thanks for the swatches and for such an honest and in dept review...as always! I really like you and your videos! Never stop, please!! I am a big football fan "Arizona Cardinals" and you just became more amazing when you mentioned Fitzgerald my favorite players name even if it was just to comment on his small waist lol. He is such a down to earth guy; I met him during spring training. I know this comment is random! Great review! I really love how Tarte is more of a natural cosmetics line than others. Unfortunately I haven't yet had a chance to try out their eyeshadows! Hey Emly, I am 14 and luuurvvveee ur videos and u had become one of my favorite gurus. I <3 that ur reviews are so honest and you don't change ur opinion on a product just because u were given the product. Some of my favorite gurus have begun to do more vids abt products they've been sponsored to promote and it bothers me but thankfuly u don't do that. Hey love the review! I love that you are so truthful and go through so much in a review. 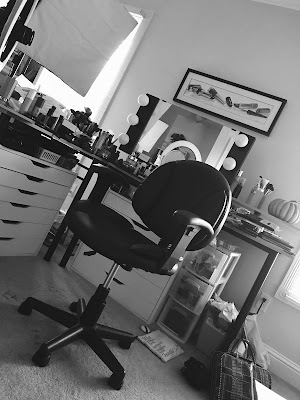 Also, I am starting my own beauty blog if anyone wants to check it out it is at http://allthingsbeautyaddict.blogspot.com any interest would be great. Hi Emily! great review! i have some tarte eyeshadows although not the two you were talking about in this review. i am thinking about getting one of these for my college aged daughter for the holidays. i love that you go the extra mile with your research, giving your opinion between the Starlet and the Glitz. enjoy your vids and your blog reviews! looking forward to the next one. I got this set about a month ago! Since then, I've been taking it back and forth to school with me and haven't had any problems with the magnets or the shadows breaking. I usually use the purse separate from the makeup itself if I'm going out. I LOVE the blush in this, but I've found the bronzer to be a little too orange for my skin. I use the matte light taupe with the green palette instead, and it looks good with those! I hope you are alerted when you receive a comment on such an old post. Tarte's Puttin' on the Glitz palette is on Hautelook today, and I came across your post when searching for reviews on the palette. I'm just curious if you still use this. I ordered it, and hopefully I won't be disappointed. They are also offering the Romancing the Glow palette, but reviews make that sound like way more glitter than I want, so I passed that one up. Thanks for any info you can give me.